It’s a sunny spring day at 25 Wisteria Lane. Flowers are already blooming in the urns that flank the front steps. 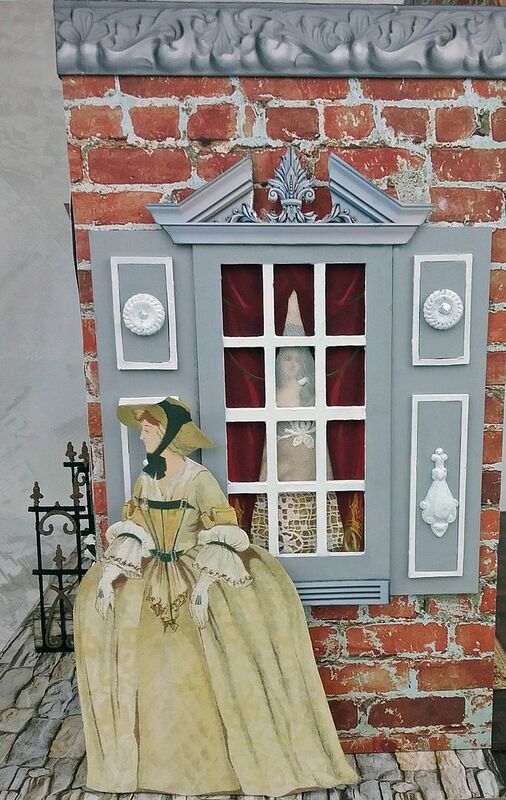 Standing on the side of the Georgian house is a lovely lady from the Georgian Fashions collage sheet. Through the curtained window you can see a portrait hanging on the wall. 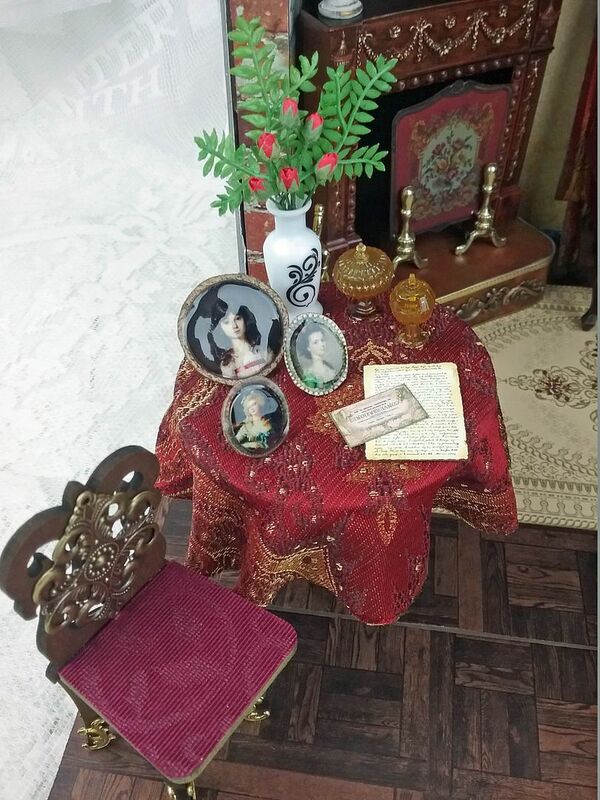 Inside the house is a ladies parlor filled with beautiful furniture and décor. 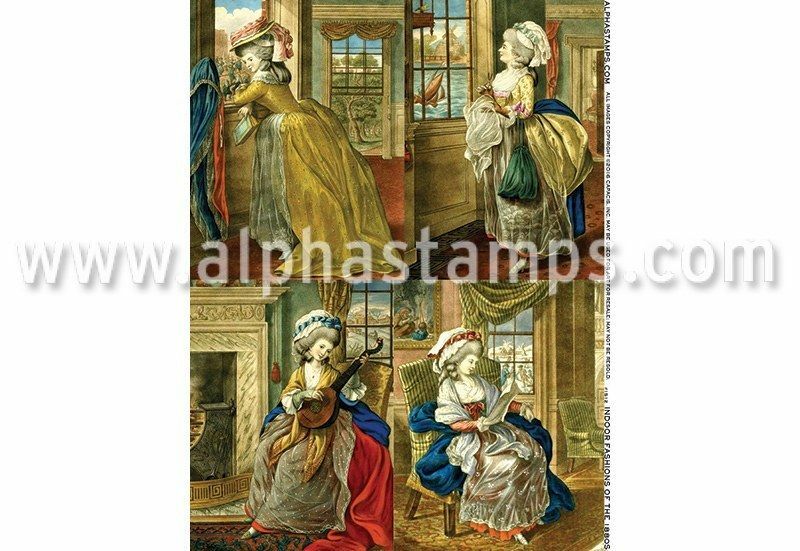 Below you can see three women from the Indoor Fashions of the 1780s collage sheet enjoying the parlor; perhaps they are sisters. 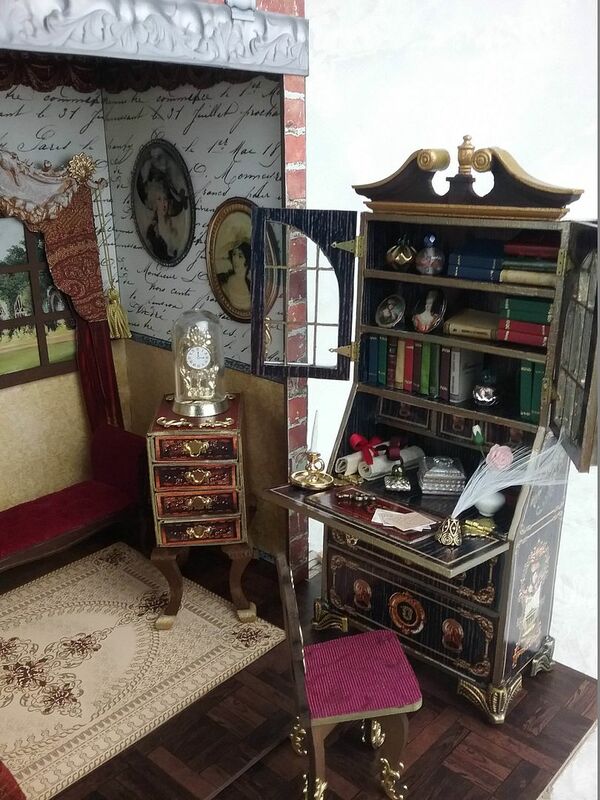 The star of the room is a secretary made from a chipboard kit. This is the inspiration for the entire project. 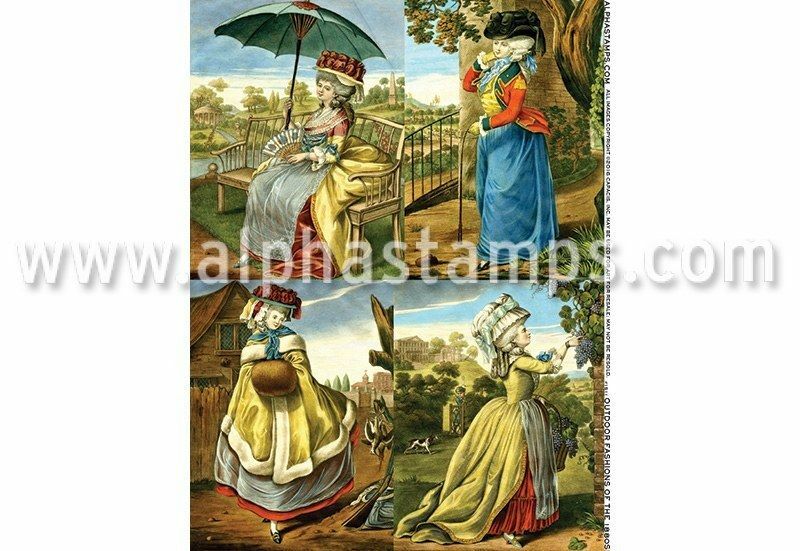 Leslie at Alpha Stamps asked me if I would like to design a collage sheet to work with the secretary. I said “of course”. My next thought was what to do with it and how best to showcase it. 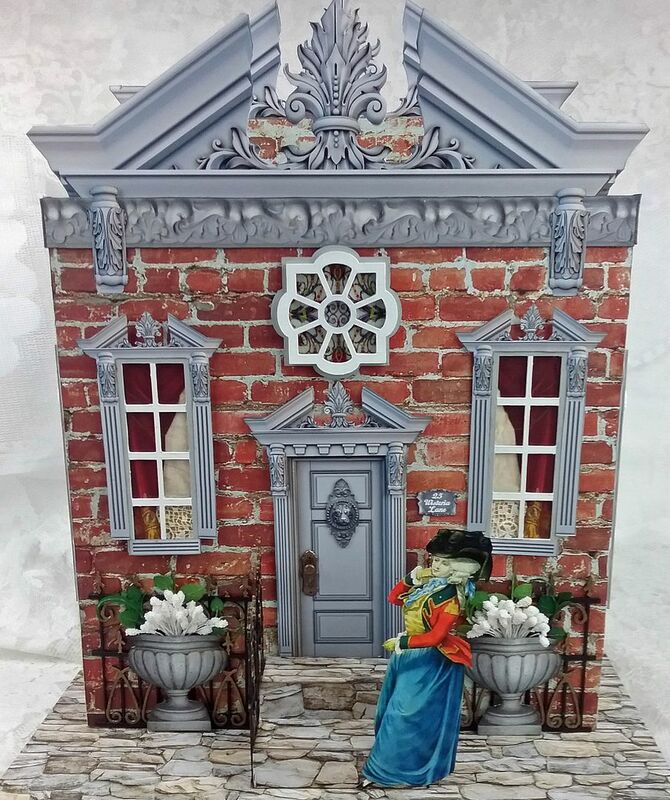 One thing led to another and I decided to create a Georgian style façade using an Deep Open Front Room Box kit and a parlor room to show off the secretary. I also couldn't resist slipping in a matchbox chest. 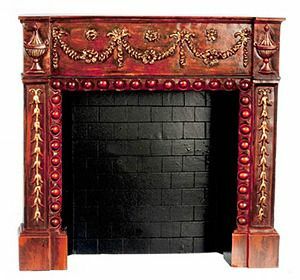 Of course the fireplace isn’t too shabby either. Would you believe that the top and bottom are Altoids Tins, ah the magic of Altoids tin. 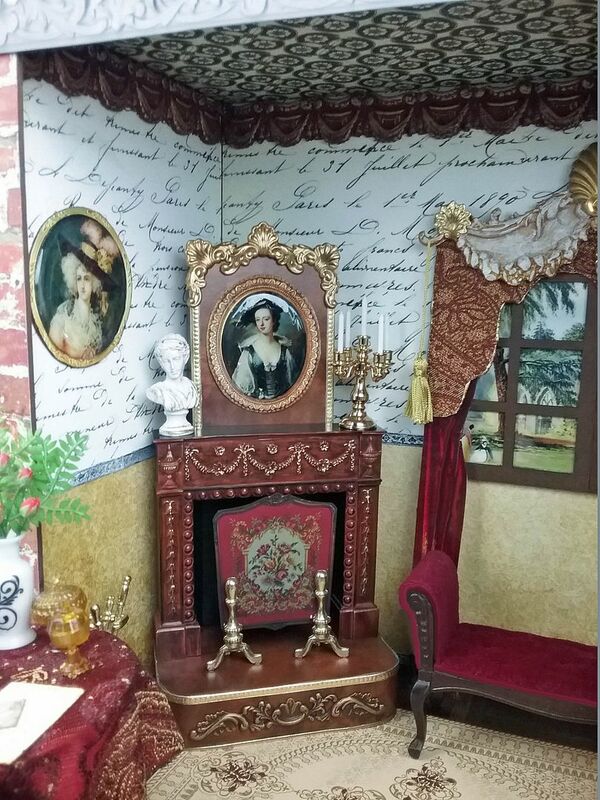 One of the women is sitting on an elegant velvet settee. 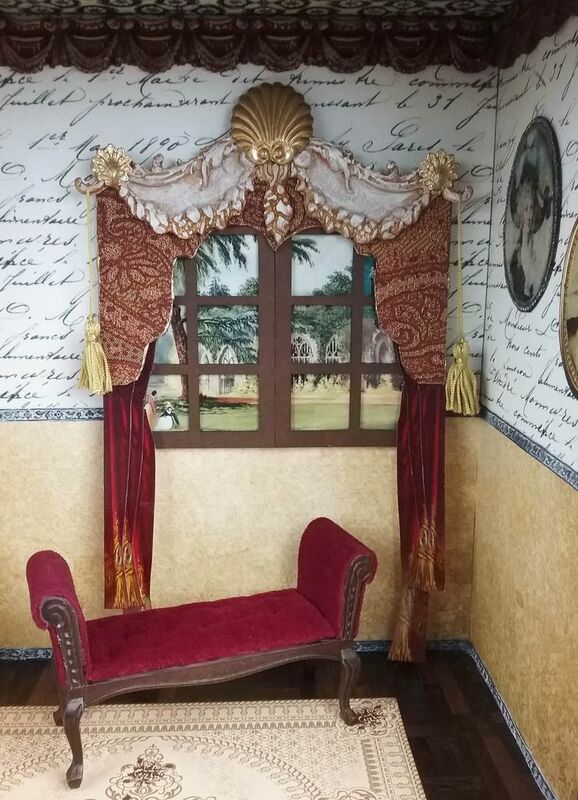 The elaborate decorative top of the curtain is made from paper clay. To go with this project are a series of new collage sheets and digital image sets. 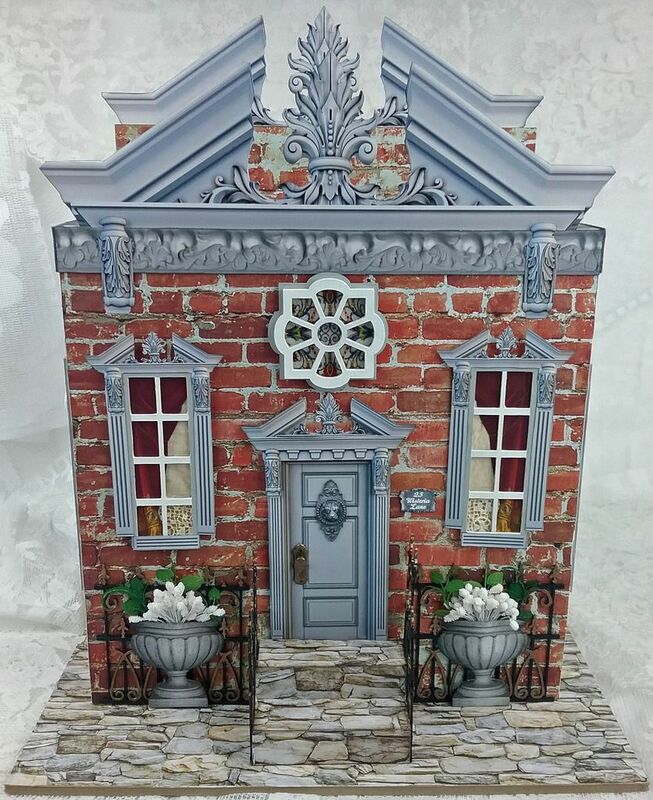 As usual I have a detailed tutorial (and many more pictures) that explains how I made the house and all of the pieces in the parlor. 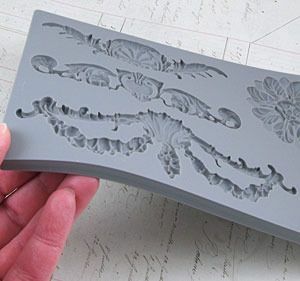 Even if you don’t want to tackle a project this large, you might find individual elements like the secretary something of interest. The collage sheets come in both 1:12 scale and 1:24 scale. 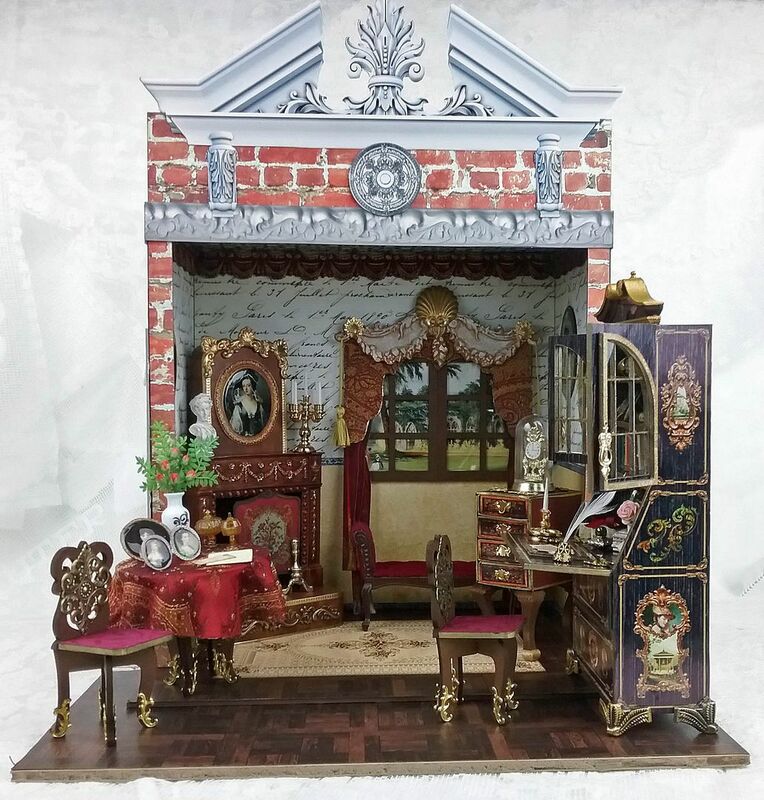 This collage sheet set contains all the images you'll need to decorate the 1:12 scale secretary. 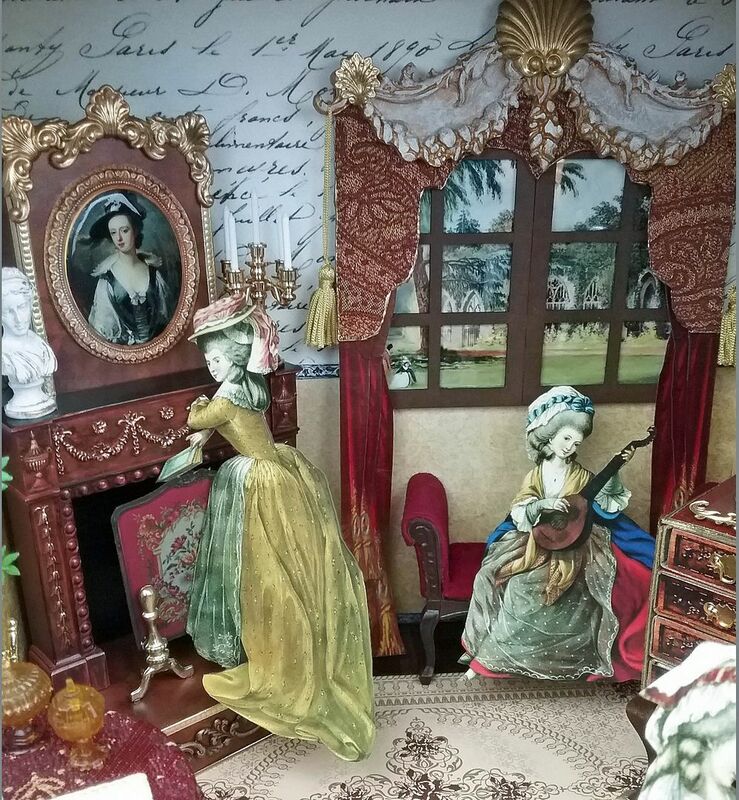 This collage sheet set contains all of the images you'll need to decorate the 1:24 scale secretary. Unlike the larger secretary collage sheet set, this sheet contains extras like the back piece and extra wood grain. 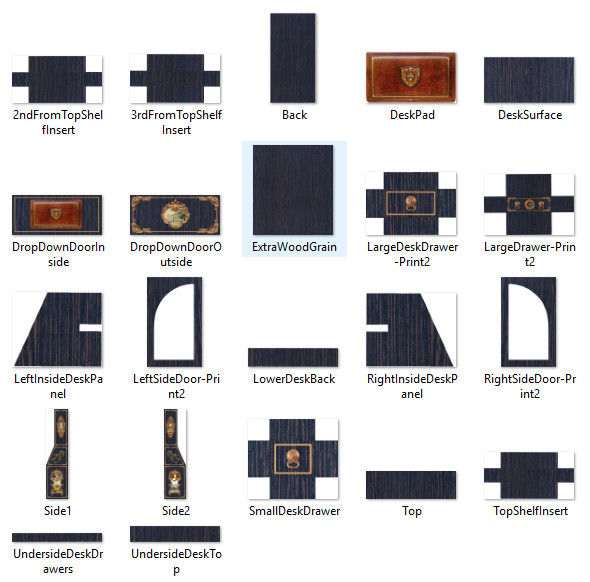 This set includes 22 images which include all of the images on the Secretary Collage Sheet plus three additional images; a back piece, a desk pad and an extra image of wood grain that can be used to cover other pieces that you might want to coordinate with the secretary. This sheet contains the images I used for the Georgian façade. 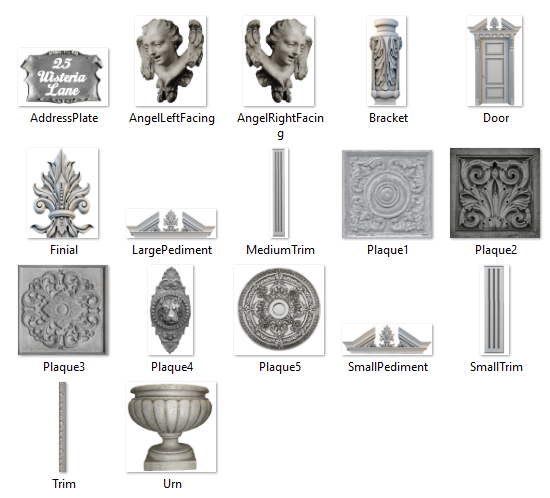 It also includes images I didn’t use such as stone angels and a variety of stone plaques. 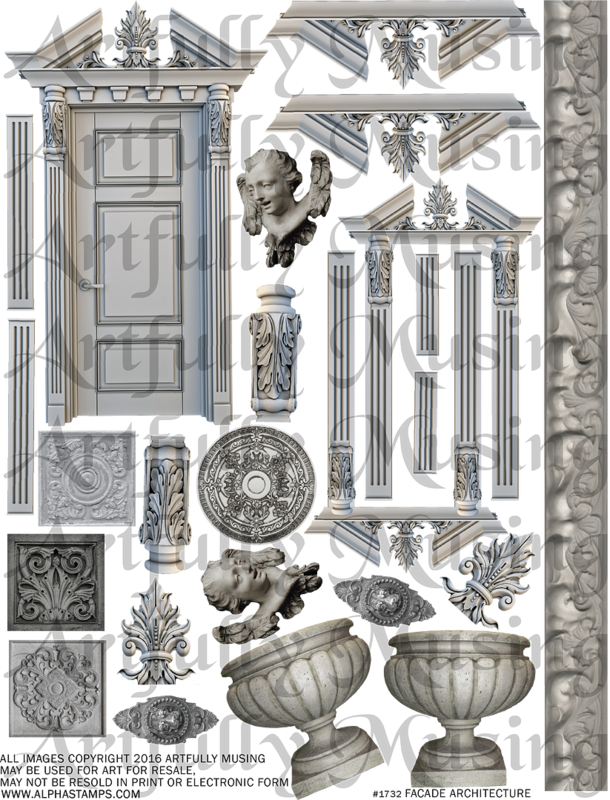 The image set pictured below includes 17 architectural images ranging from a door, pediments, moldings, plaques and other decorative elements. 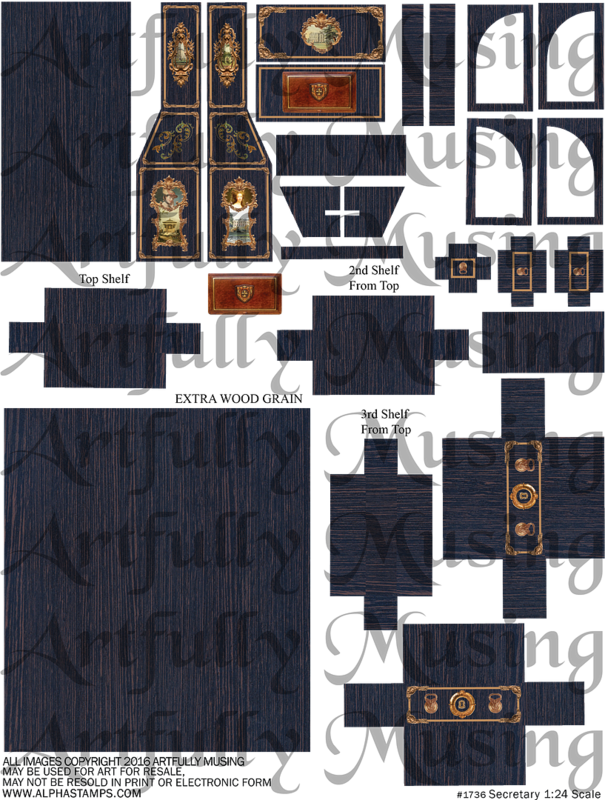 The images are scaled to fit the Open Room Box carried by Alpha Stamps, but can be easily resized for your project as the files are high resolution (300dpi). 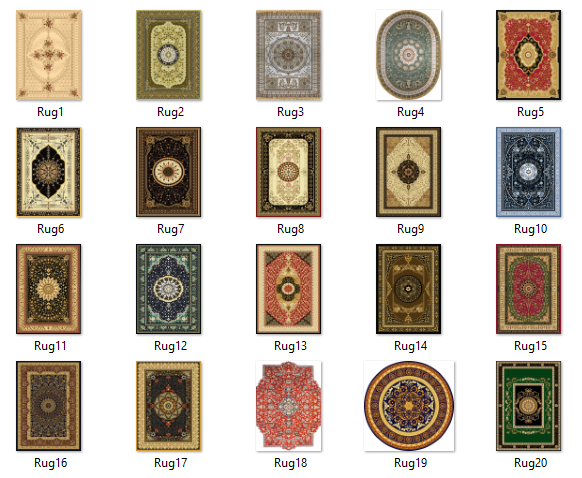 This image set includes 20 rugs sized 7”x5”. Since the files are high resolution (300dpi) it’s easy to size them for you particular project. All of the images of ladies you see in the project are from these two new lovely collage sheets. 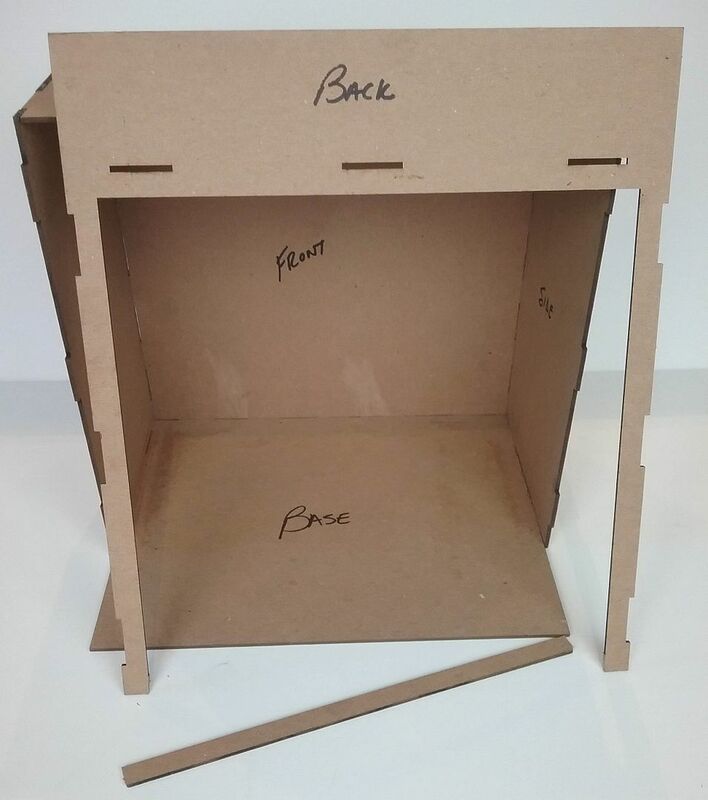 The structure of the piece is made from a Deep Open Front Room Box kit. 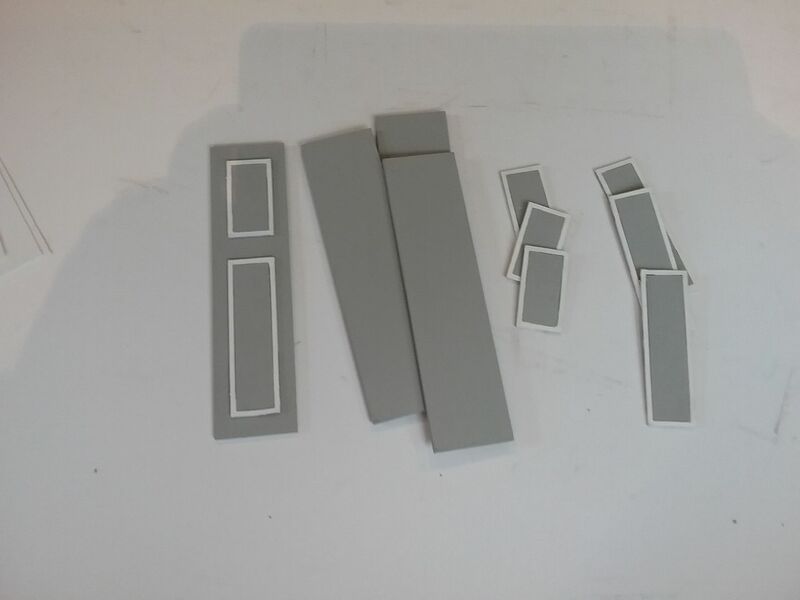 In the picture below you can see that I have labeled the pieces to help with assembly. I started by gluing together the front, base and sides. 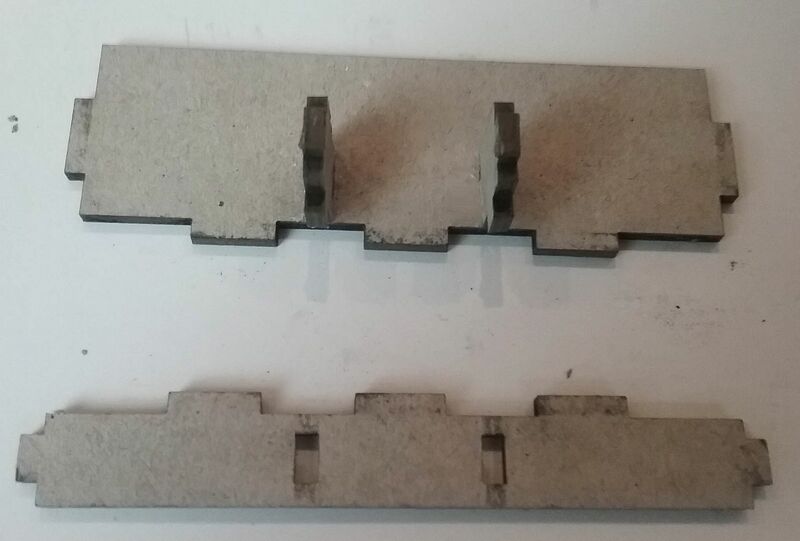 Notice that I cut away the bottom piece of the back. 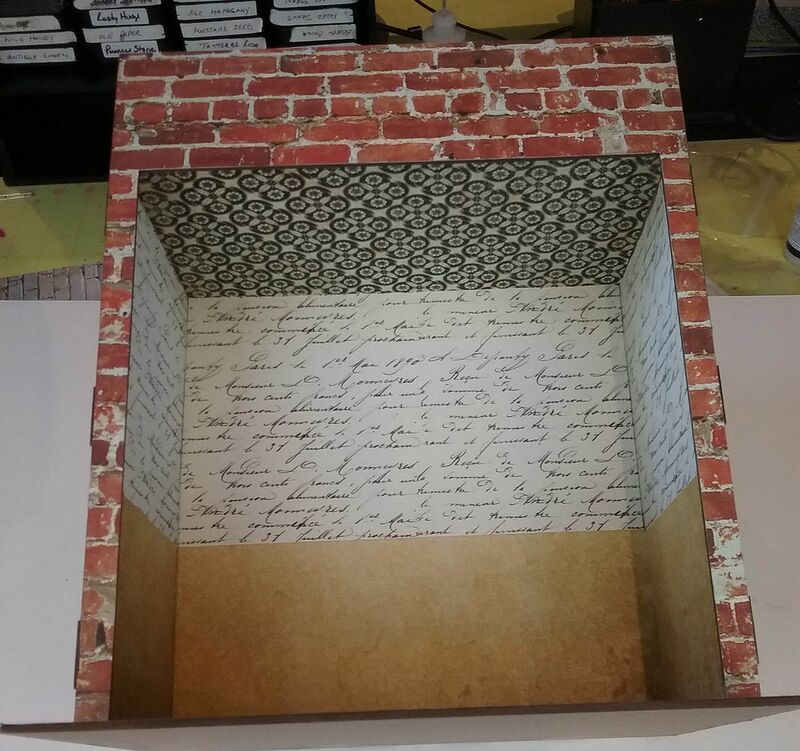 Next, I added the brick paper to the front and sides. To the insides I added 3 different papers to the ceiling and walls. I also added parquet paper to the floor. I next, papered the front side of the back piece and then glued it to the box. Lastly, I papered the back side of the back piece and the roof. The cornice on the inside of the box is a resin molding that I painted with burgundy acrylic paint and then rubbed with gold acrylic paint. Around the top outside of the room box I attached molding from the Facade Architecture collage sheet backed with lightweight chipboard. 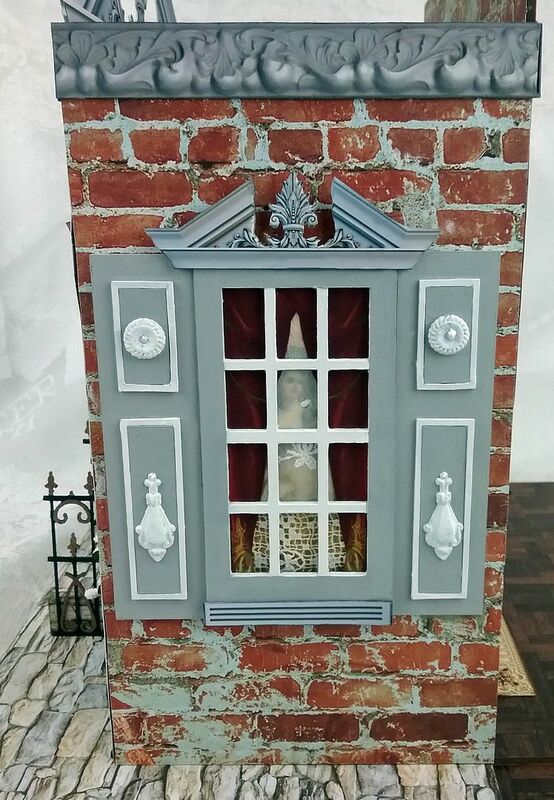 Looking through the windows on both the front and the sides of the house you can see paper and lace curtains and a picture hanging on the wall. 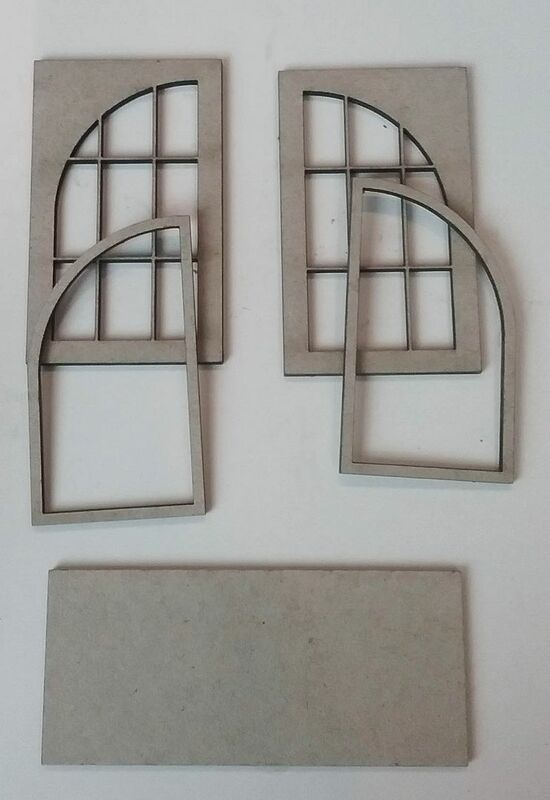 The side windows are from a window set. I used the 12 pane window and shutters from two sets. 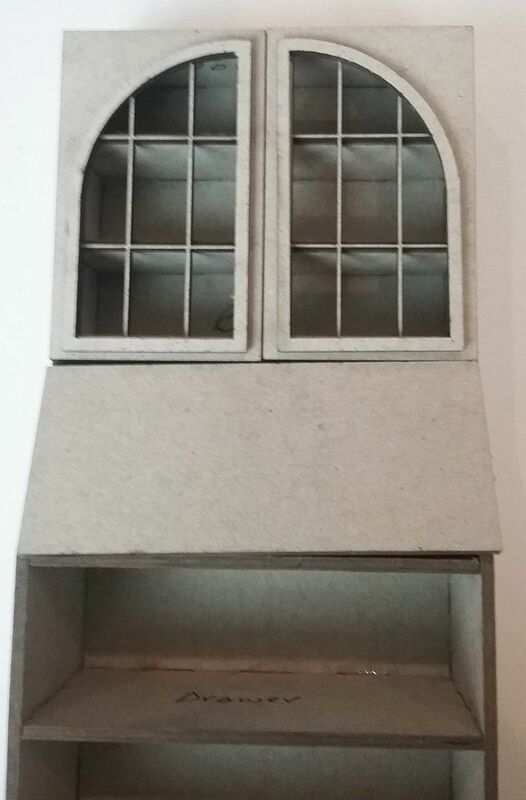 In the picture below you can see the process I used to put the windows together. 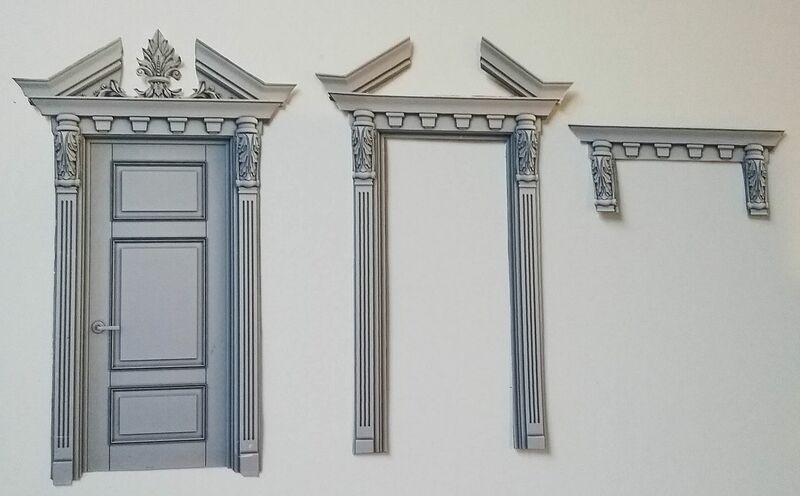 From the Façade Architecture collage sheet I added the pediment and bottom trim. 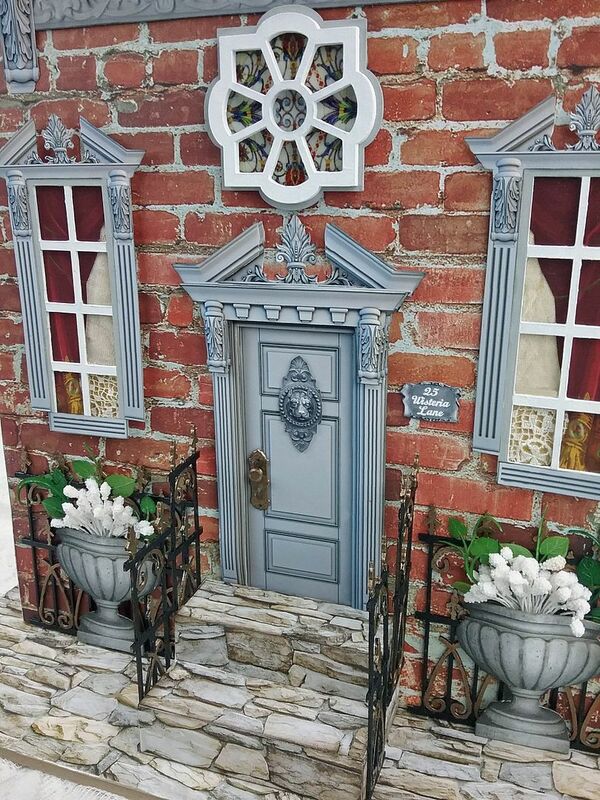 I painted the shutters using the same paints as the windows. To add more interest to the shutters, I added a brass drop and a rondelle painted with the Ivory White paint. I stippled the paint on to give it more texture. 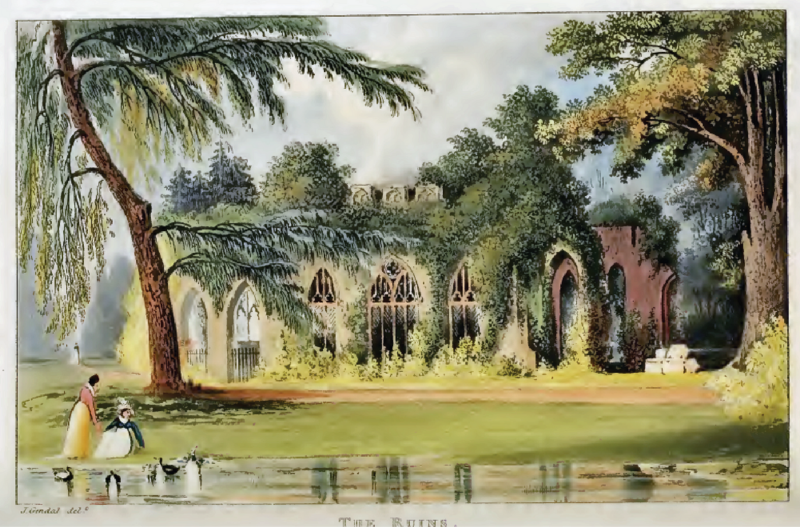 The window above the door is from a set of decorative windows. 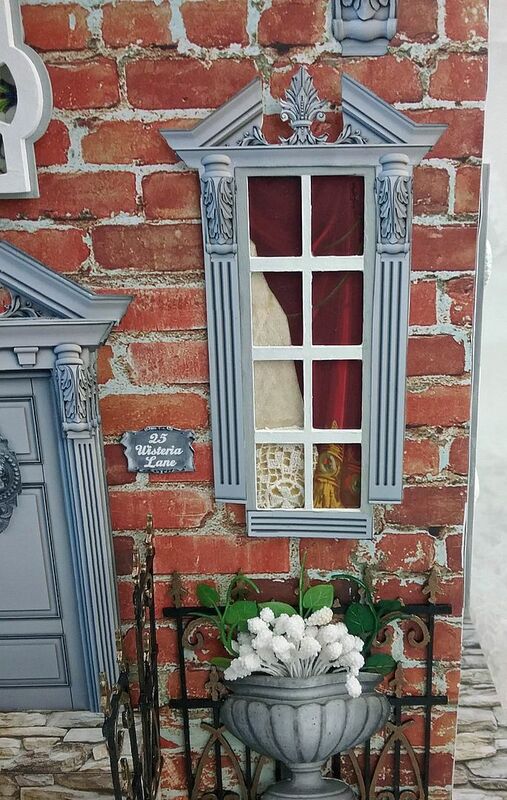 Behind the window is an image that I printed on vellum, coated with VersaMark, sprinkled with embossing powder and then melted the powder with a heat gun. This technique makes it look more like stain glass. 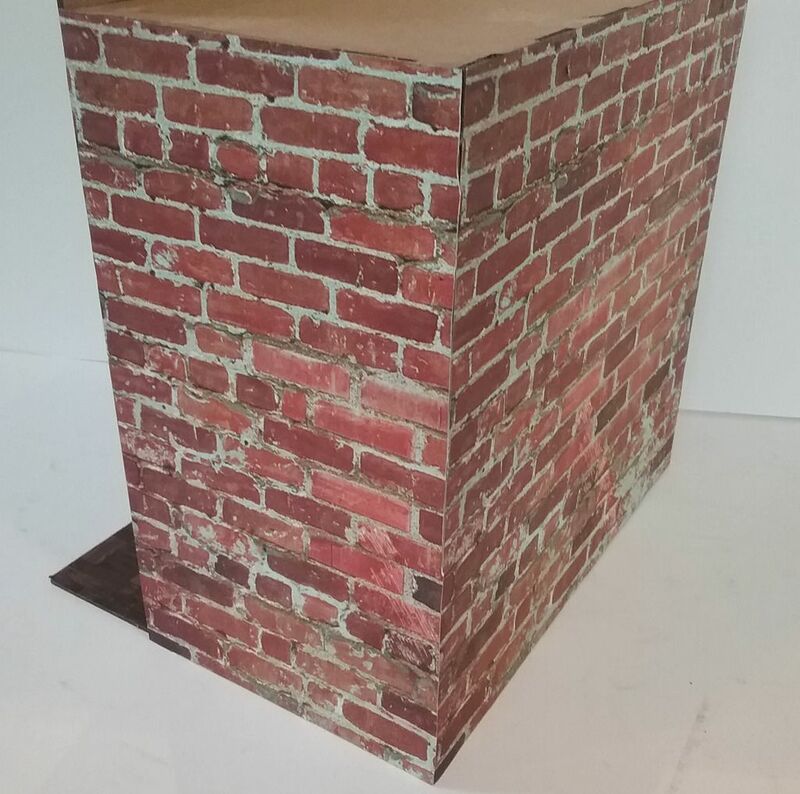 I backed the image with white paper to block out the brick paper and to make the image look brighter. At the bottom of this post you’ll find the image that I used. The front windows are made the same way as the side windows (minus the shutters) but with a set of 2 narrow windows. 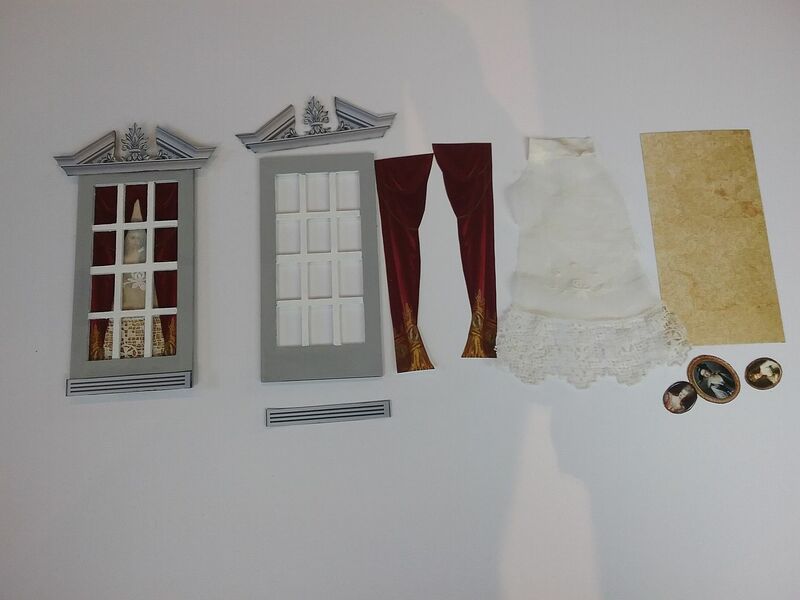 I also used an image from the Facade Architecture collage sheet to dress up the windows. To add dimension to the door, I printed the image three times. Below you can see what I did with the three images. 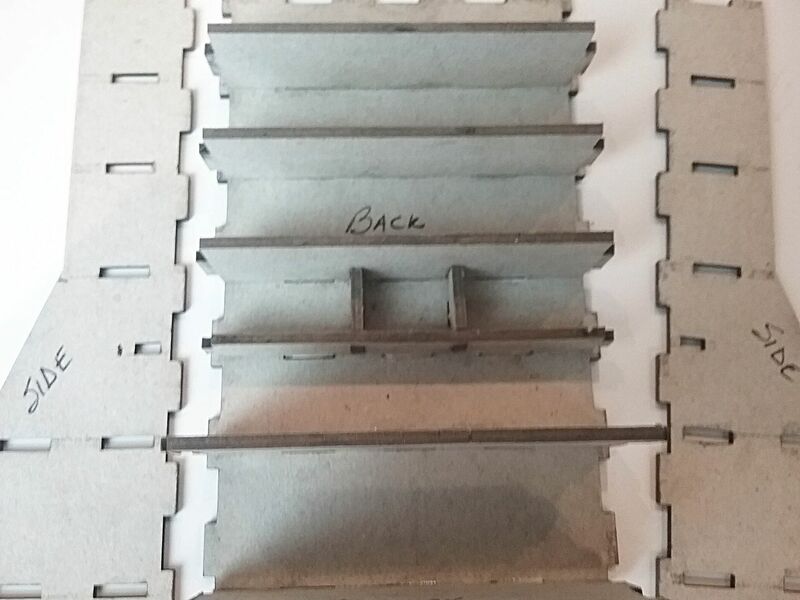 I added double stick foam tape to the 2 images on the right and then stacked them one on top of the other going from the image on the right to the left. 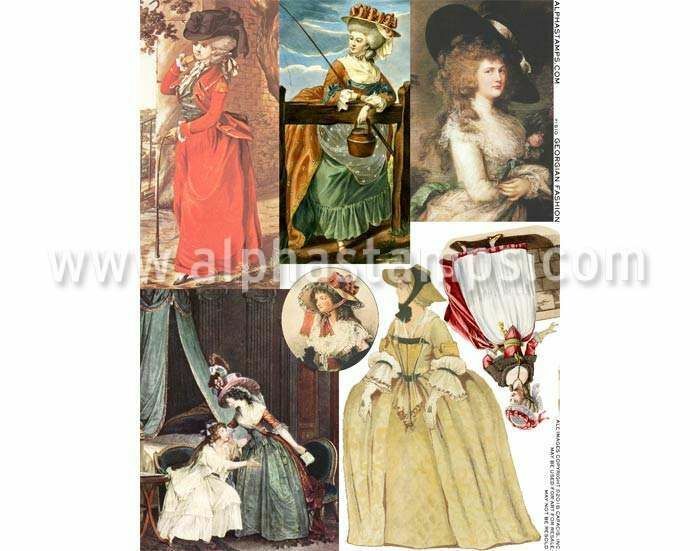 Also note the addition of the woman from the Outdoor Fashions of the 1780s Collage Sheet. 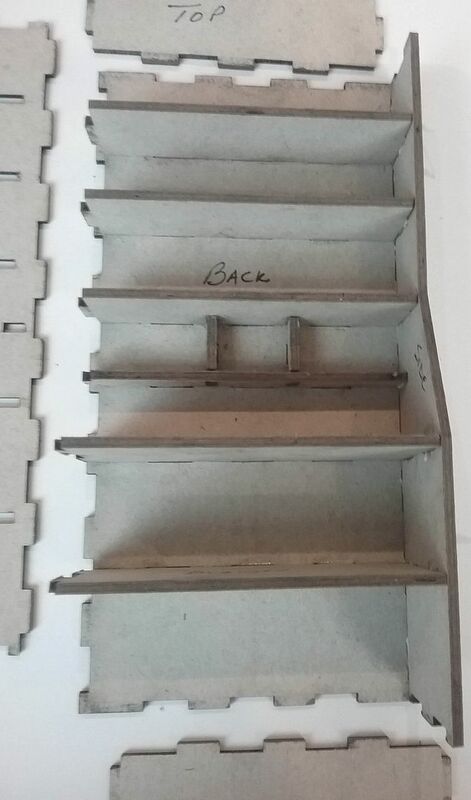 For the stairs I used a 2 stair kit. 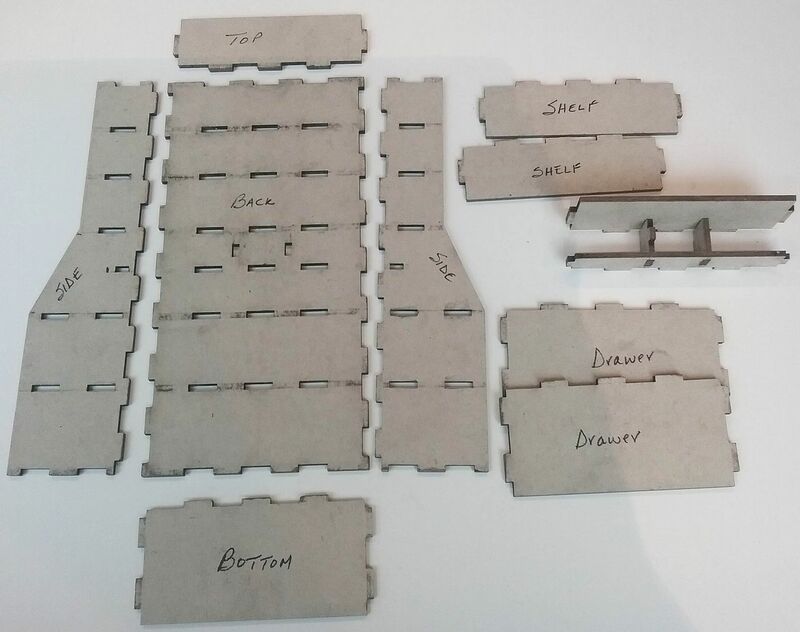 Below I have marked the pieces to help you with assembly. 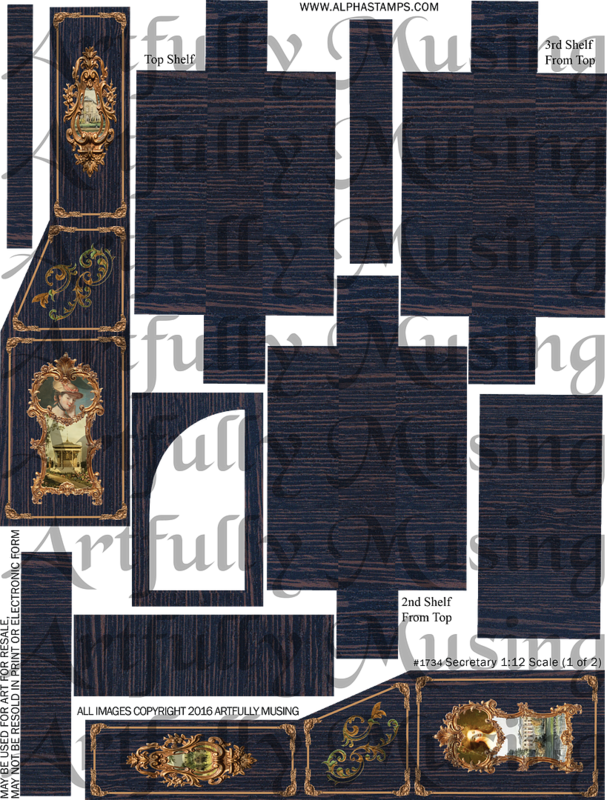 I also have pictures that show the order in which I put the pieces together. To create the fence flanking the stairs and in front of the house, I used two pieces of chipboard fencing. 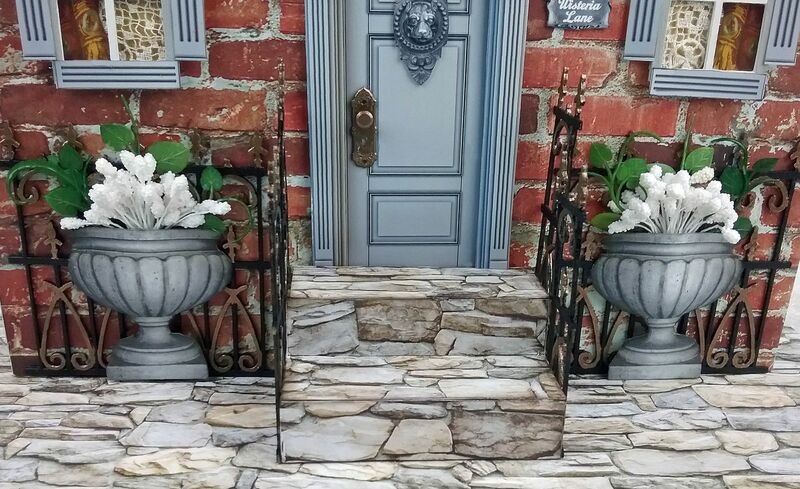 I painted the fence black and then accented decorative details with gold paint. The urns are from the Facade Architecture collage sheet and are filled with white stamens and greenery from a fern garland. 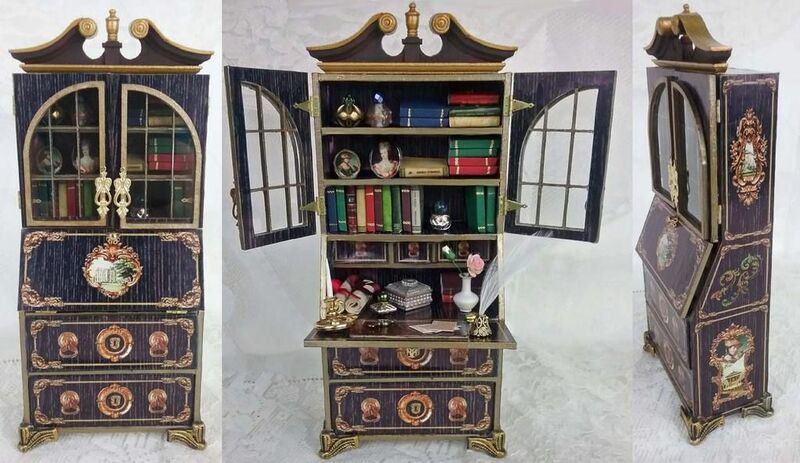 The secretary is made from a kit. 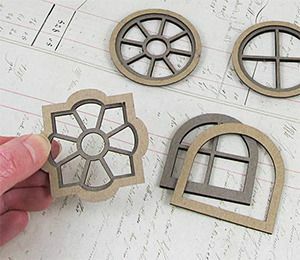 Alpha Stamps is carrying both a 1:12 scale kit and a 1:24 kit. 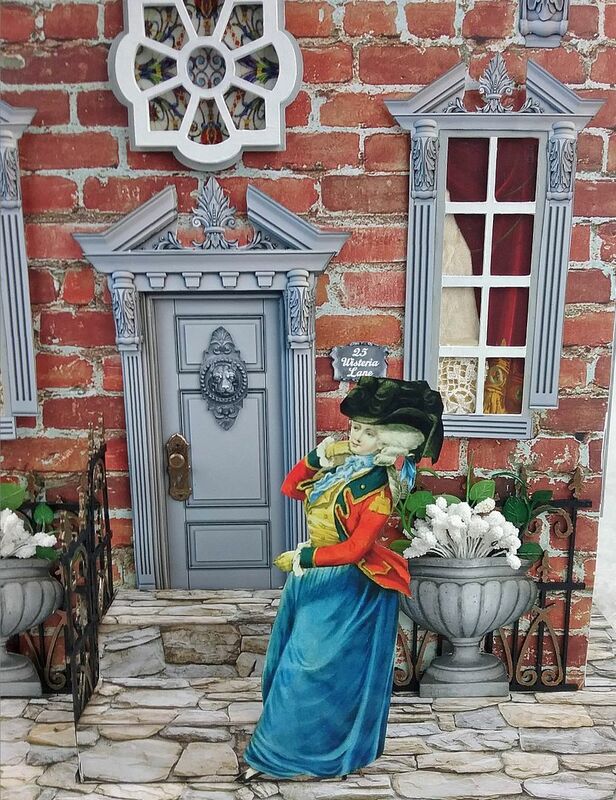 The kit used for this project is 1:12. The Secretary collage sheet set (or digital image set) contains all of the images that you will need to paper the secretary. 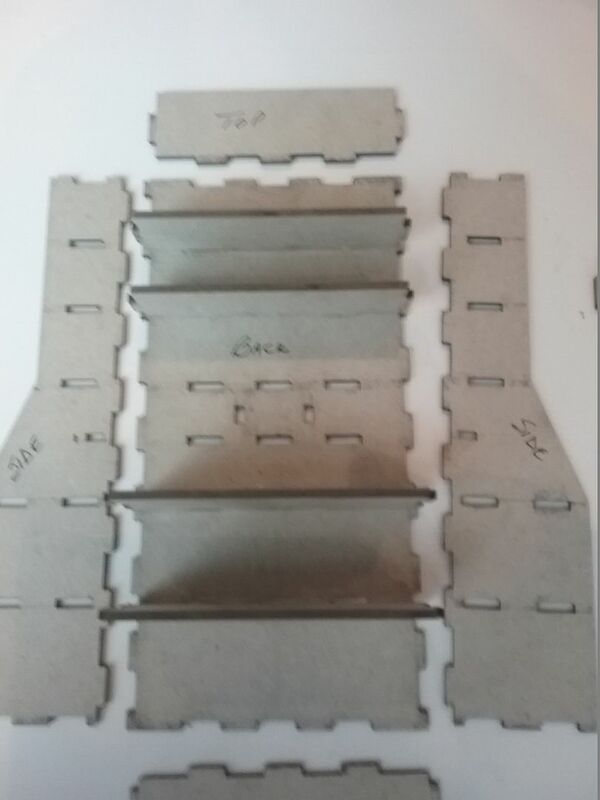 Below is a picture of pieces in the kit. 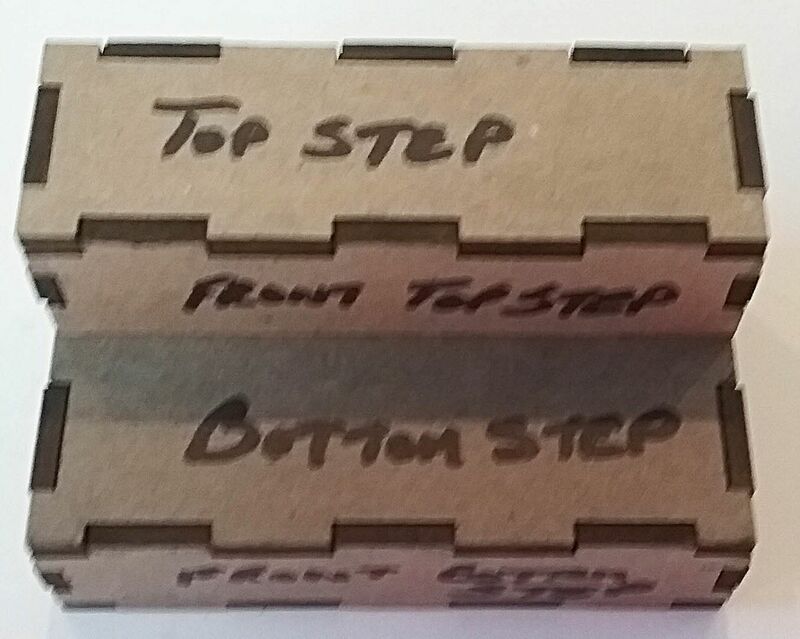 I have labeled each piece to help you in the assembly of the secretary. 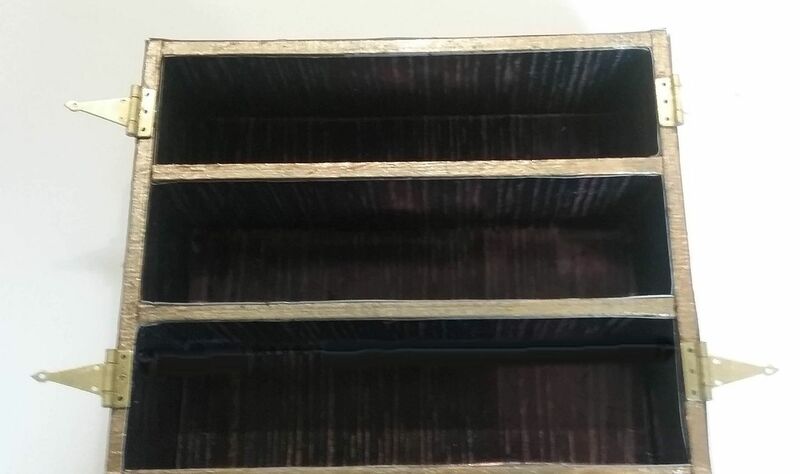 First, I glued in place the shelves on the top and the separators for the drawers at the bottom. Next, I glued together the center section which accommodates the small drawers in the desk part of the secretary. Then, I glued the center section in place. I glued one of the sides in place and then the other. Lastly, I glued the tops and bottoms in place. Below you can see the assembled secretary minus the glass and drop down doors. 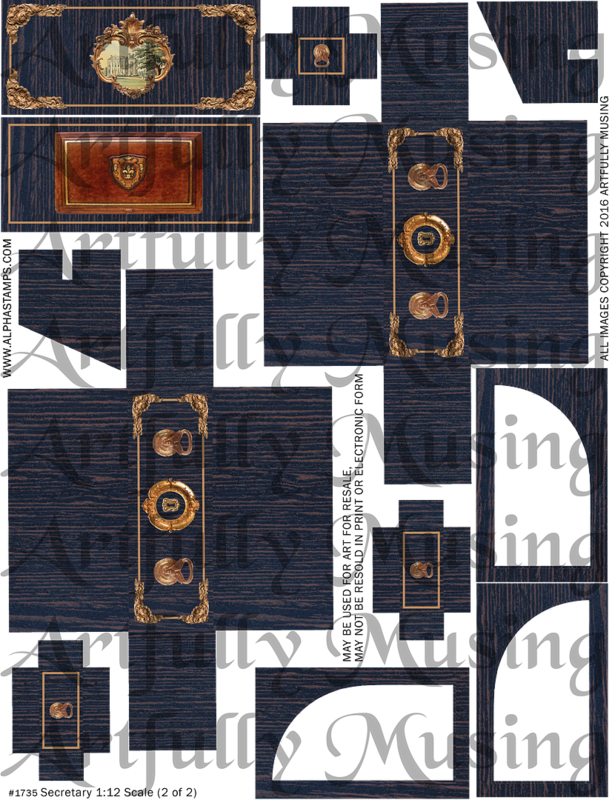 Below you can see the doors which have decorative trim pieces. Before adding the images from the collage sheet, I painted all of the edges with gold paint. Basically paint anything that might show after adding the images. Fold and add the image inserts to the shelves and glued in place the glass door hinges. Add the images to the drop down door. 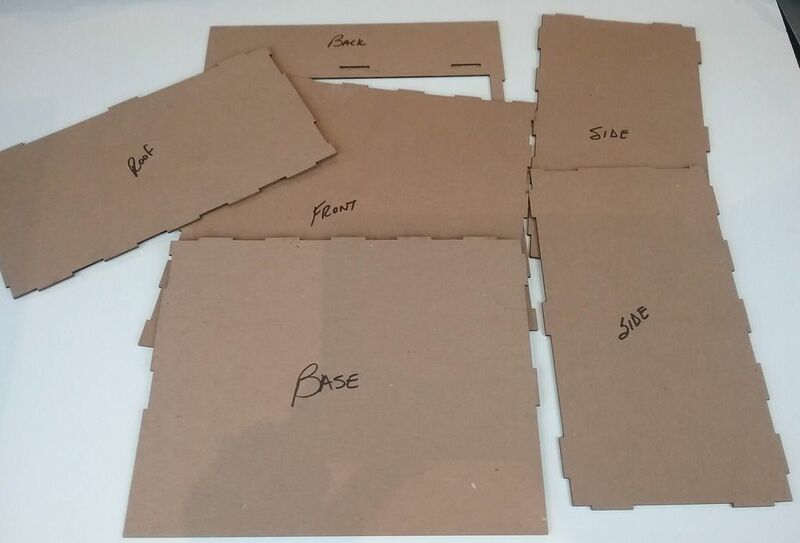 NOTE: Be sure to glue them in the right direction as the direction is different for the outside image of the framed picture and the inside image of the desk pad. 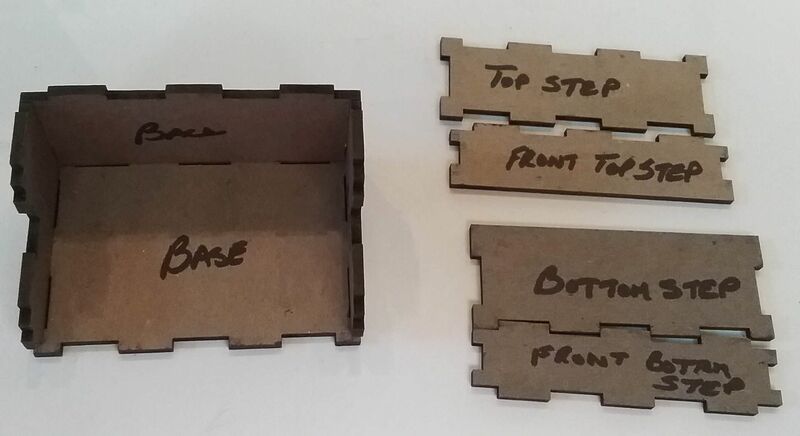 Add the images to the desk bottom and sides. 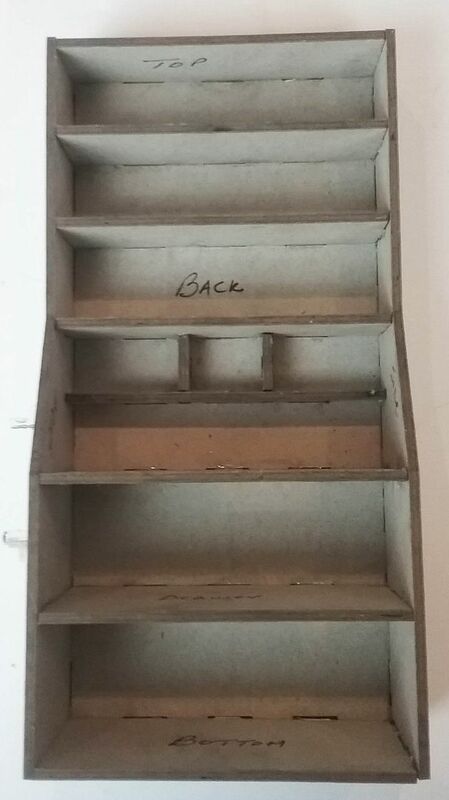 NOTE: be sure to add the desk side images (ones with the notches) to the desk sides before adding the small drawers. Fold and insert the small drawers and large drawers in place. Add the rest of the desk images (back, under the small drawers and top of the desk). These images are small strips of wood grain. Glue one side of the hinges to the edge of the desk. Glue the other side of the hinge to the drop down desk door. Cover the front and back of the doors with the images from the collage sheet. To the back of the decorative trim I added clear plastic that looks like glass. 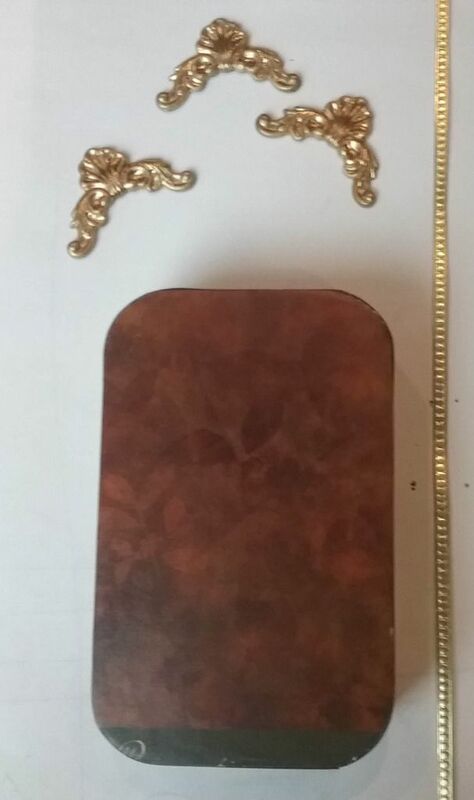 Glue the decorative trim to the front of the doors. Glue the hinges to the doors. 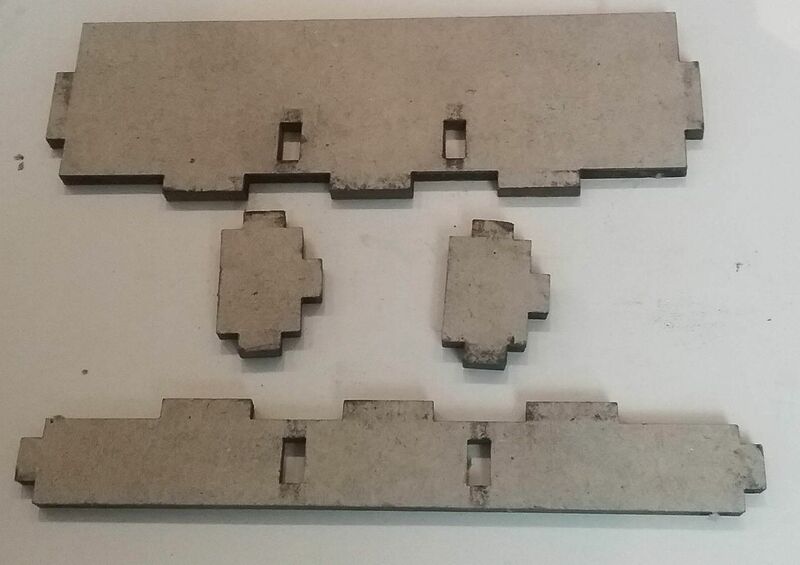 I added connectors to the front of the doors to serve as pulls. The final architectural touches are a wooden pediment at the top and brass feet at the bottom. 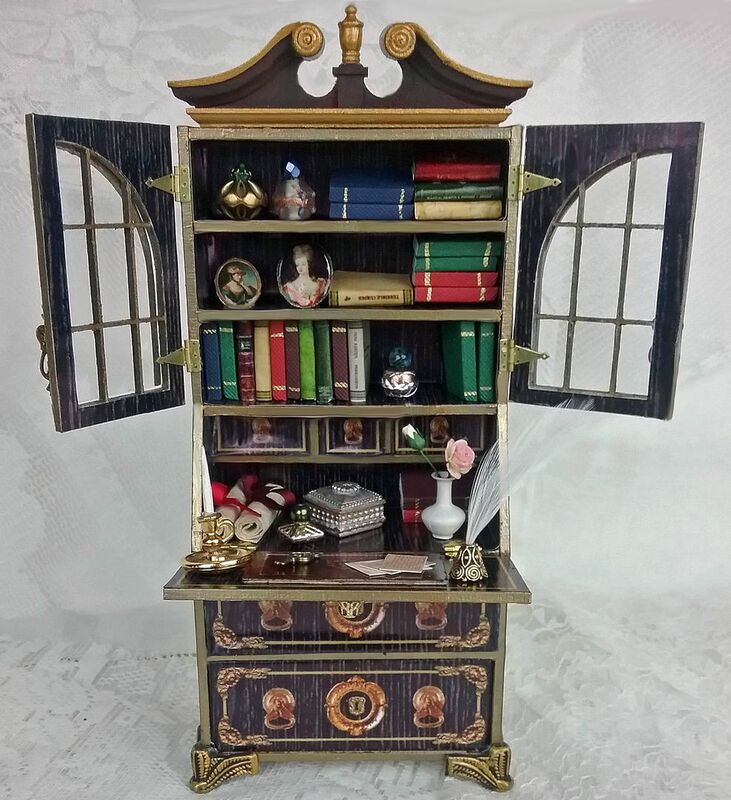 I filled the secretary with miniature books, bottles made from beads and images from the Portraiture collage sheet with Glossy Accents applied to make them look like glass. 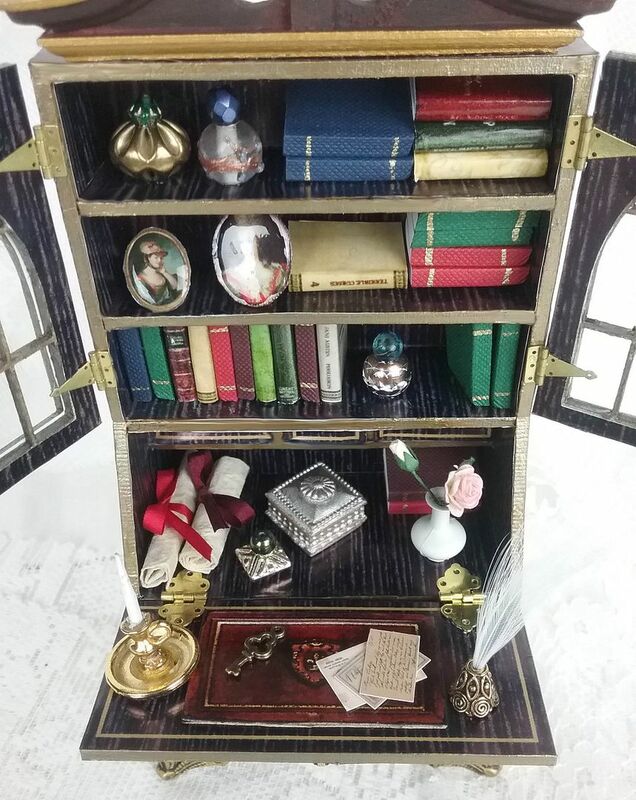 A metal box, candlestick, vase with roses, an inkwell with a feather quill, scrolls of paper tied with ribbon and letters from the Little Library collage sheet. 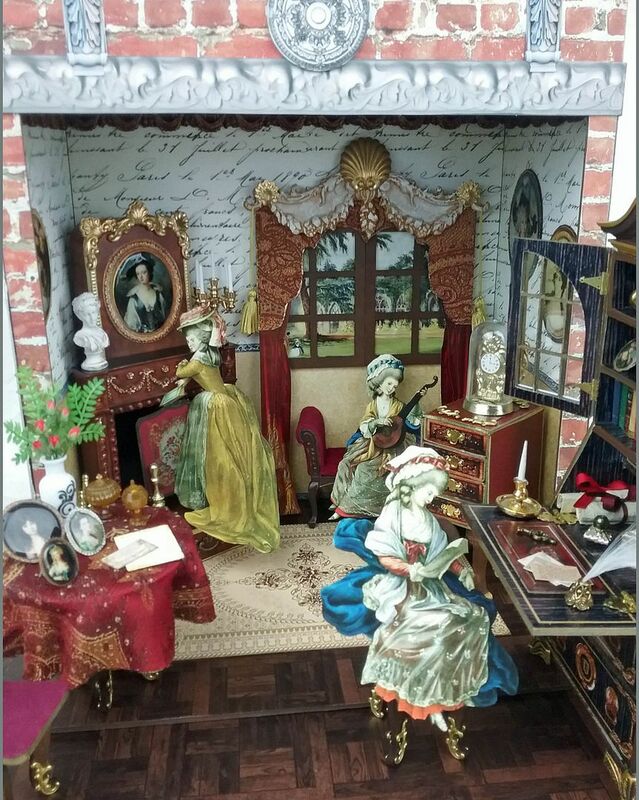 In the center is a miniature Victorian fireplace. I wanted to scale the piece up so I used Altoids tins at the top and bottom. The tin on the bottom is covered with decorative paper from my stash, it just happened to match the patina on the fireplace. 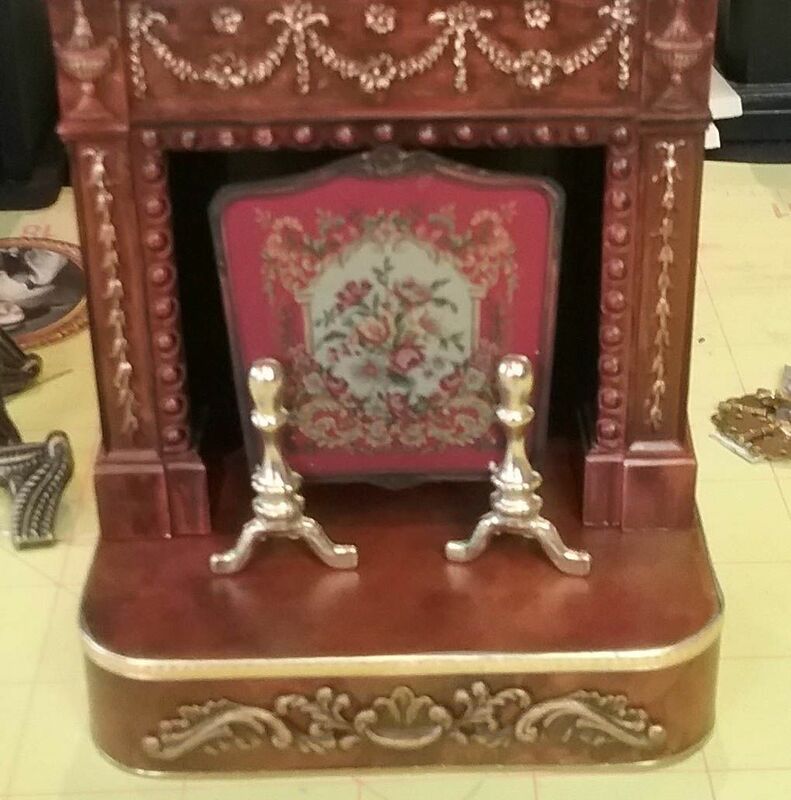 To dress up the base, I added a piece of filigree and Dresden. 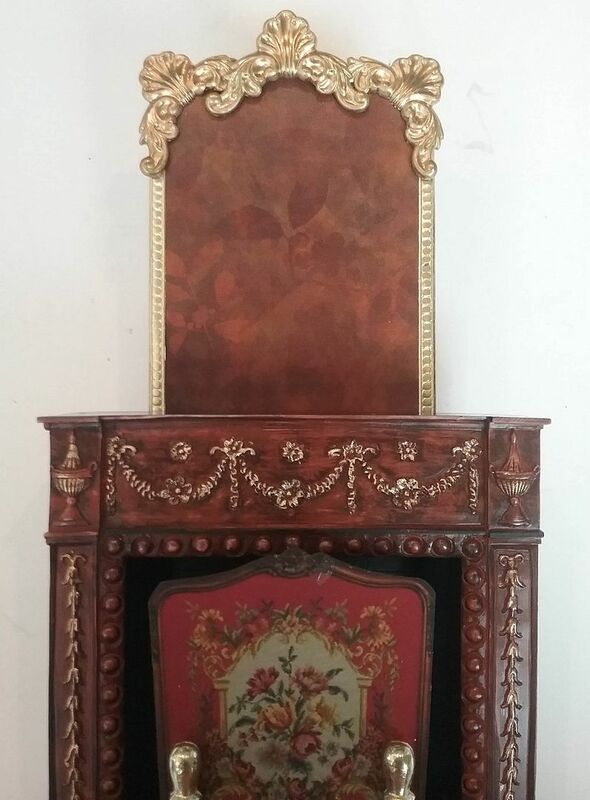 In front of the fireplace is a screen made from a set of fireplace accessories and an image that you will find further down in this post. 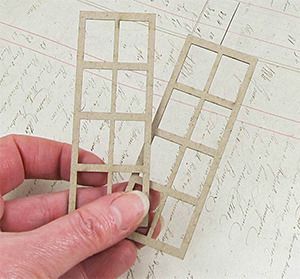 The tin on the top is covered with the same paper and trimmed with the same Dresden. To further dress up the top, I attached three brass shell corners. In the center I attached a picture from the Portraiture collage sheet with a faux glass dome made from Glossy Accents. 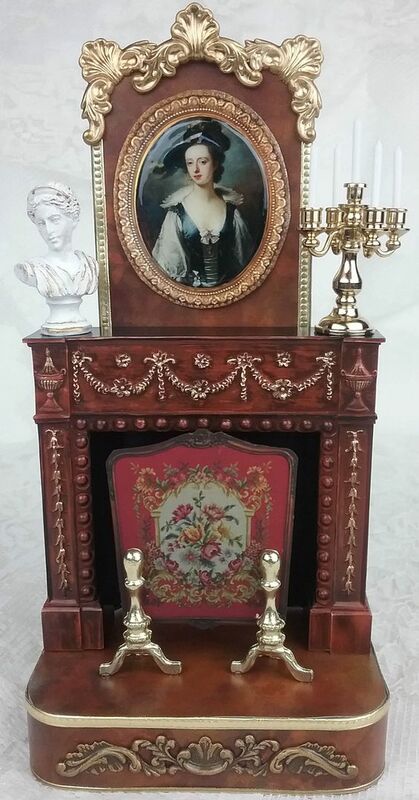 On the mantle is a bust of Diana and a candelabra. The chest is made from a stack of 4 matchboxes and cabriole legs. On the outside is faux leather paper from my stash. The images on the fronts of the drawers are from the Matchbox Drawers collage sheet. 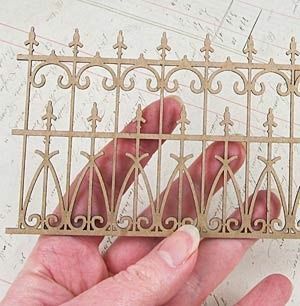 The pulls are cute miniature brass drawer pulls, which would also work well on the secretary. 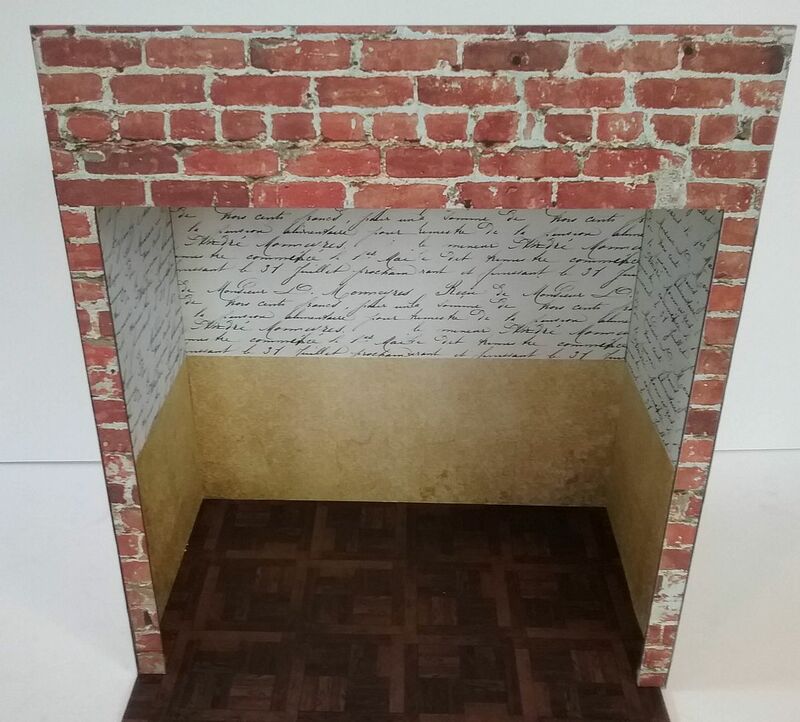 The clock on top comes with the the fireplace accessory set. I decorated the top of the chest with brass flourishes. 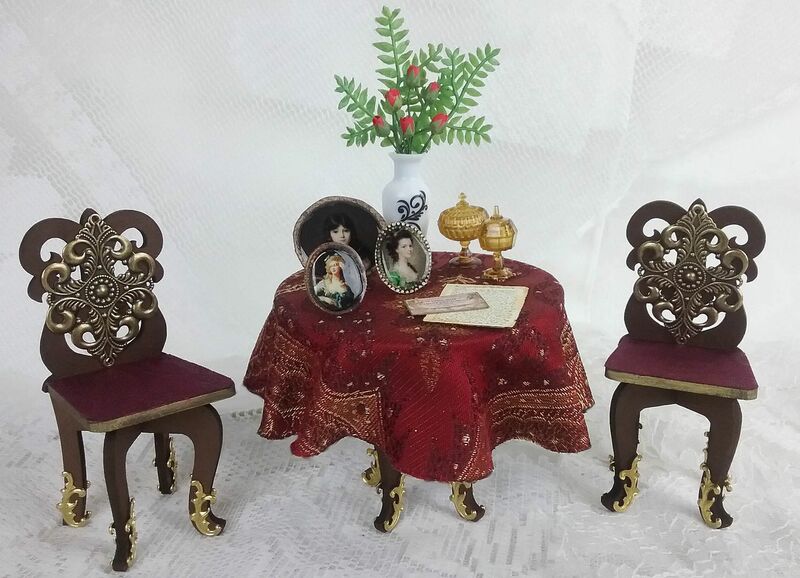 The table and chairs are from a chipboard set. I covered the table with fabric from my stash. The chairs are covered with fabric paper also from my stash. To dress up the legs of the chairs and tables I used brass flourishes. 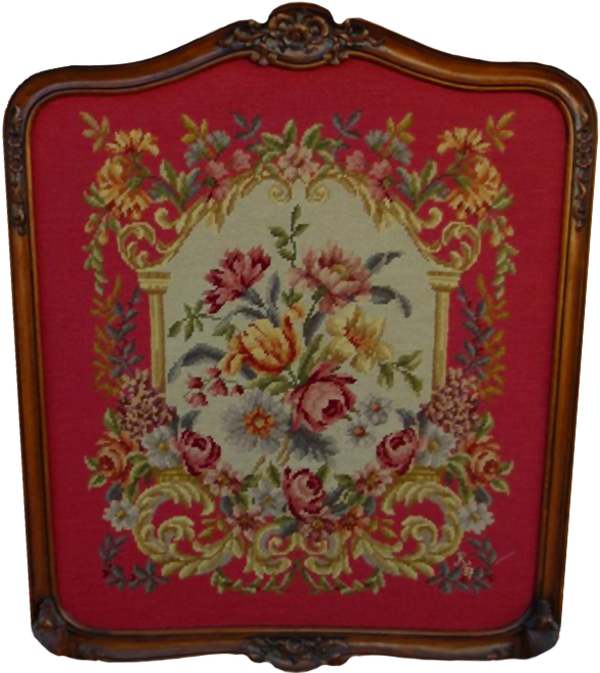 To the backs of the chairs I added a piece of brass filigree. On the table is a mini vase with roses. This vase and the one in the secretary comes from a set of vases. Also on the desk are amber candy jars and more pictures from the Portraiture collage sheet. 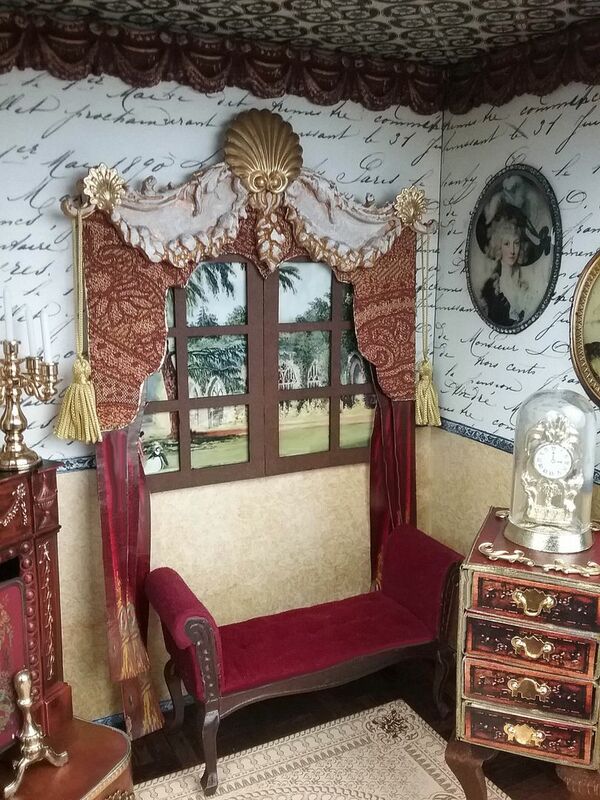 The burgundy curtains are the same ones I used on the outside windows and are a as a downloadable image. On top of the curtains is a cornice made from chipboard and covered with the flip-side of the fabric I used on the table. 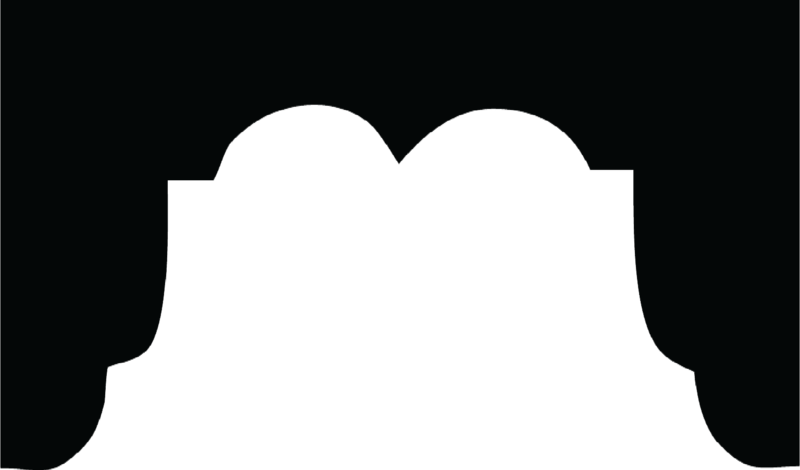 Feel free to download the cornice template below. 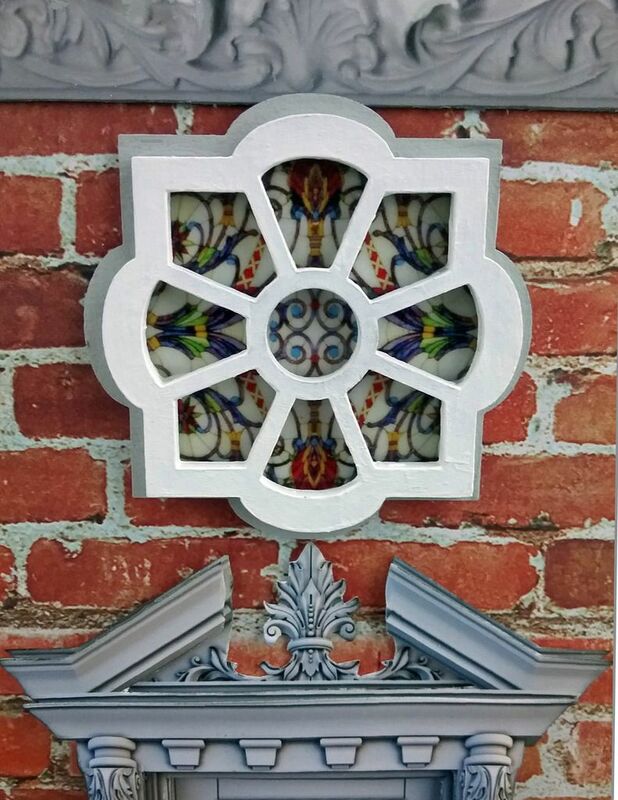 On top of the cornice is a decorative piece made from clay and a baroque medallion and filigree silicone mold. I first painted it gold and then when over it lightly with an ivory acrylic paint. The finish touches are brass shell pieces and gold tassels. The window is made from two rectangular windows glued together. 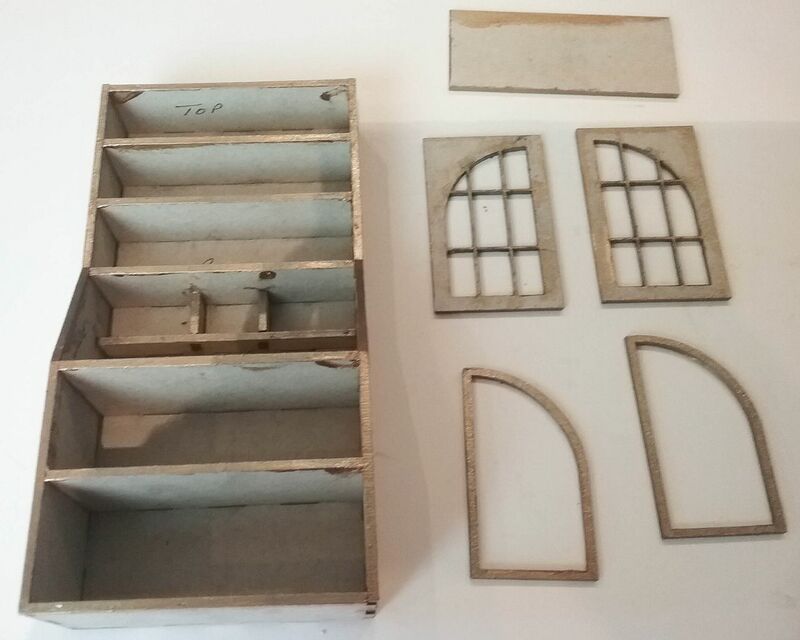 Behind the window is clear plastic (the same plastic I used for the secretary) and behind the plastic is a scene that you will find further down in this post. On the walls are more images from the Portraiture collage sheet. 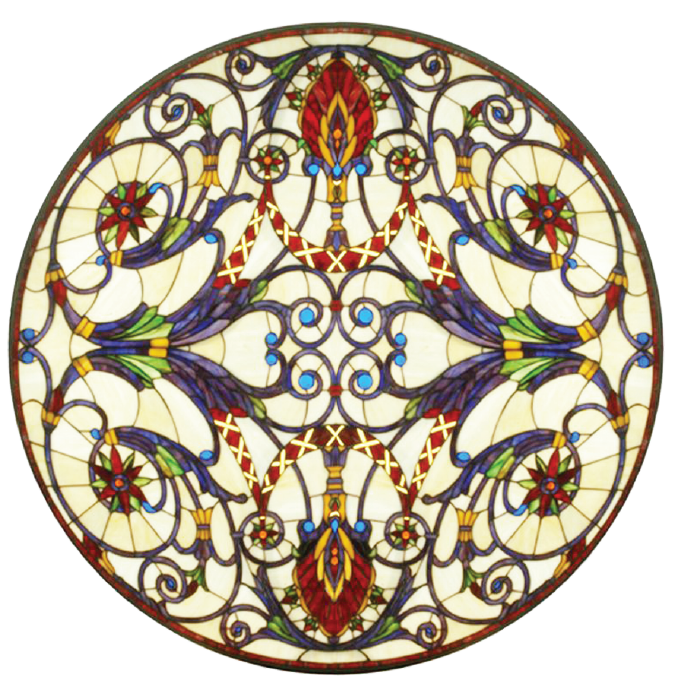 Feel free to download the stain glass window and fireplace screen images that I used in the project.